In his A History of American Magazines Frank Luther Mott, credits Harper’s Weekly as the most important magazine on the East Coast in the nineteenth century. The management of the Harper brothers, the writing and editorials of George W. Curtis and the drawings of Thomas Nast “combined to make Harper’s Weekly popular and powerful” (40). Exactly how powerful is difficult to quantify, at least in terms of circulation numbers. Mott makes a point to establish that publishers of this era did not maintain circulation statistics and took offense with inquiries into same. The information was deliberately mysterious. “There was something sacrosanct about circulation figures.” But by 1874, Mott had determined that Harper’s monthly and weekly publications had subscription lists of more than 100,000 each (6). This of course does not account for newsstand purchases, and pass-along readership shared with a neighbor or friend. According to an Ohio State University website that maintains a measure of Harper’s scholarship, the weekly had a circulation of 120,000 in 1861. Perhaps owing to the circulation mystery to which Mott alludes, Wikipedia quotes circulation figure of 200,000. HarpWeek, the official website for the magazine states, “Its circulation exceeded 100,000, peaking at 300,000 on occasion, while readership probably exceeded half a million people.” Whatever the figures were, by the standards of its time, Harper’s Weekly stood as a successful publishing venture. 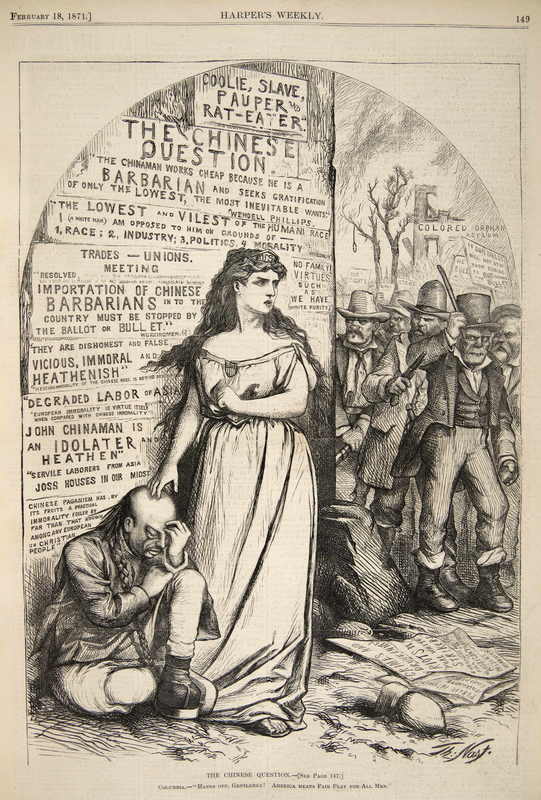 Nast’s artwork, particularly his political caricatures, is widely acknowledged to be the major ingredient of the magazine’s growing prosperity. Images mattered. The illustrated weekly format provided an alternative conveyance for messages that resonated with the public, sometimes more effectively than the word. According to the National Center for Education Statistics, 1870, the first year such data was recorded, illiteracy rates for whites was 20 percent and for blacks, nearly 80 percent. With a weekly deadline, illustrated magazines grew in popularity complementing hard daily news with images. Photos were reproduced by copper, then later steel plate etchings and illustrations were drawn to scale, often in reverse to be transferred from paper, or drawn directly on, a large cross-section of boxwood. The areas not receiving ink– the white areas– meticulously carved out by a staff of engravers, leaving only the black lines in relief to press against the page. (A mind-boggling feat given the prolific crosshatching in Nast’s work). In New York City, the most notable weeklies were Frank Leslie’s Illustrated News, the New York Illustrated News, and the most respected and prominent, Harper’s Weekly. Nast had worked for them all–and in that order– but happily achieved his goal to work full time at Harper’s in 1862 (Paine 28). Established press organizations in the northeast largely promoted Protestant-based, pro-Republican ideals, and during the Civil War, adopted a pro-Union stance in their editorial positions. The two leading daily papers, The New York Tribune and the New York Times, were Radical Republican and mainstream Republican.” The publishers and staff of Harper’s Weekly, including cartoonist Thomas Nast, were mainly Protestant or secular liberals” (Kennedy, HarpWeek). The more progressive Tribune led as an early advocate for abolition and “attacked Lincoln daily, demanding emancipation” as a cause for Lincoln to adopt (Paine 79). Other media followed suit. Harper’s was “strongly Methodistic in trend” (Mott 86) and part of a publishing center that “loathed the political culture and style of the Democrats and resented their control of the metropolis,” (Fischer 8). Northeastern Methodists joined other Protestants in a strong alliance of moral authority and civic duty that sought freedom of slavery. “No single issue had greater power than slavery to shape Methodist political responses,” (Carwardine 597) and Northeastern Methodists, like most Protestants in that region, were Lincoln supporters. In 1861, a year before he began as a staff artist at Harper’s, Nast married Sarah Edwards, the daughter of English-born parents. Nast figuratively and literally, as historian Robert Fischer suggests, “married into old-line Yankee culture and embraced it with the fervor of the prodigal son come home” (29). His background, the culture of his employers (cartoon historian Donald Dewey writes that the Harper family had an established anti-Catholic bias) and marriage into an Anglican family all coalesced to shape Nast’s Republican views, steeped in the conviction of perceived Protestant superiority. Journalistic historian Thomas C. Leonard offers the term “visual thinking” to describe the effect Nast’s woodcuts had on Harper’s readership. The public had learned to rely on Nast’s cartoons as a legitimate form of truth telling. “Harper’s Weekly drew power from common knowledge of illustrations as well as the public’s hunger to see more of them” (102). Leonard cites the Nast’s series of anti-Tweed images as the most effective use of visual thinking. Nast’s images resonated and were eagerly awaited by Harper’s readers. Many Nast scholars maintain that his “dammed pictures” led to Tweed’s downfall and to his eventual arrest in Spain by someone who saw the fugitive’s likeness in the magazine. The illustrations added to the overall dialogue. “Harper’s verbal descriptions often missed the visual clues and the radical elements of [that] Nast’s images” were able to capture (Hills 111). Nast’s power and popularity gave him free artistic reign at Harper’s. He drew what he wanted. “Nast drew only what he was moved to draw for Harper’s Weekly, having no editorial or ownership responsibilities. Nast refused to draw anything he didn’t believe in” (Dewey 10). Nast enjoyed artistic autonomy under Fletcher Harper, but this artistic freedom dissipated after political editor George W. Curtis assumed the managing editor role after Fletcher’s death in 1877. Citing various modern sources, the consensus is that printed magazines are “passed along” on average four times. This figure may be conservative for the late 19th century. There are numerous references to Nast as a major contributor to Harper’s success. Paine, his biographer, quotes Colonel Watterson as saying, “In quitting Harper’s Weekly, Nast lost his forum: in losing him, Harper’s Weekly lost its political importance” (528). Tweed is reputed to have said, “I don’t care so much what the papers say about me. My constituents can’t read. But, damn it, they can see pictures!” This quote appears in almost every account of Nast’s work. It may be true, it may be apocryphal.